Chana Masala is one of the most liked side dish for Poori at home. Sunday Breakfast is mostly Poori Channa and it’s with difficulty that I have to get the kids try some other side dishes. During the initial days of marriage, Sundays was always a time to relax with a cup of coffee and read the papers and if time permits, watch the Rangoli on TV. Off late I have not been following this ritual, what with the kids getting up with us and at times we find we don’t have time to drink the coffee properly too. Kids are adorable no doubt but taxing at times. My daughter when she was until 3 or 4, used to sleep along with us and wake up the same time. So never really gives us time to even sit for a moment. Now I find she sleeps late on holidays. But at times, on Sundays she gets up with any nudge from us. My twins on the other hand, off late have got into habit of sleeping after we do, and getting up along with us. But whatever happens, Sundays are dedicated to Pooris. This gives us the pickup needed to run around for the next whole week. This is also to ensure we don’t get hungry for a quick lunch, as Sundays it’s always late lunch. When I was with my parents, it was a different story. Amma used to prepare Bhaturas and we generally used to wander around, gardening and doing other unrelated things, but with kids around I don’t find time to prepare Bhatura, so it is only pooris. We alternate the side dishes with either Channa Masala, Potato bhajji or Yellow Moong dal / Pesarapappu Kura (as we call in Telugu). Today its going to be Poori with Channa. This is different from the Chole Masala I made for Bhatura. Wash Chana couple of times and soak Channa overnight with plenty of water. When cooking it, change water again, take it in a pressure cooker, add a pinch of salt, and pressure cook for 3 to 4 whistles. Make puree of Onions and Tomatoes separately. Heat oil in a nonstick pan, add onion paste and cook well until raw smell is gone. Then add ginger garlic paste and fry for 2 mins. Then add tomato puree. Next add all the spice powders. Cook for 5 mins till oil comes out. Then add the cooked Channa to the pani. 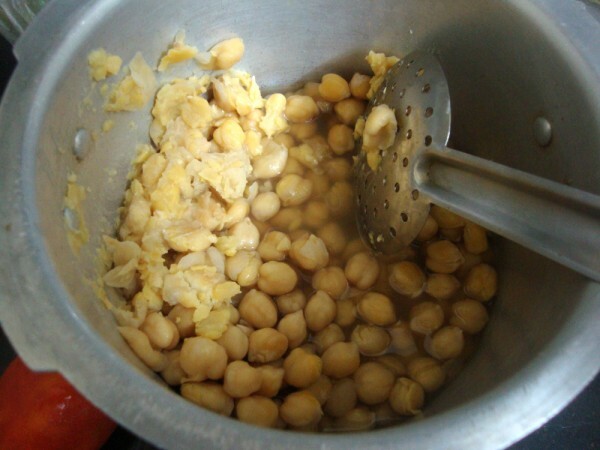 Mash some channa, so that the gravy becomes thick. Simmer it for a while, until you get a thick gravy. The plate looks very inviting.Great combination.Adding a little rava to the atta while kneading makes the pooris stay puffed up for longer and consume less oil too. Very interesting to know about your kids. just now got up in the morning and yet to have breakfast.. ur poori and channa are tempting me to take a bite..
Hi Srivalli! this is my favourite combo. Looks great and yummy. Great post about your kids. Thanks for sharing. u know what i too made poori today but to go with it i made puri curry served in restraunts.But i love chole this time i try ur style.nice to know about ur kids. And puri goes well with kids. do you do long distance delivery? looks so yummy. i’m too lazy to make this, but love to eat it. I love poori-channa combination. As a kid, when I saw that my mom had soaked channa in the morning before she left for work, I would be so happy, knowing that we’d be having poori and channa for dinner that night! 🙂 Yours looks so good. your plate is very tempting!!! Looks yummy. Thanks for the tips. Always avoid making poori thinking of the oil,that will be consumed. You really have good energy to manage the kids and make these delicious breakfast. Cheers to you ! Pass me that plate please. wow! interesting idea to make the gravy thick and consistent.. thats a constant prob i face while making channa..
and yes, bharathy is my big sis 🙂 9.5 years older! BTW, I am really happy many of you got to see the wonderful Taj made of roses. I posted it for all Indians staying away from their home country.All good things shared spreads happiness. What a lovely little brunch! Looks delicious! For the Independence Day celebrations, though, it must be poori-bhaji, and cooked within this week, between Aug12-Aug19! yes Cynthia..are you not also? You are just-in-time for Mad tea party’s event…poori chana looks great!